This has been one of my favorite salads for years. Once in college I made it every meal for 3 months straight! I like it for three reasons; it always tastes great, it is extremely easy to make and it is very inexpensive to buy the ingredients. 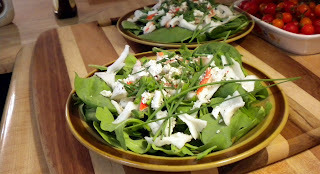 1 Bag of Arugula, 1 bag of baby spinach, 1 8 oz of flake imitation crab, 4 oz feta cheese and a handful of chives cost about 15-20 bucks and makes about 8-12 great tasting salads! What a deal! I have had it with more dressing types than I can count and have settled on Balsamic vinaigrette and Sweet Onion dressings as my favorites. I hope you enjoy! Toss together Arugula and baby spinach in a medium bowl and then separate evenly onto two plates. Sprinkle 1 half of intimation crab over each plate, sprinkle with feta and then chives. Drizzle each salad with desired dressing, crack fresh pepper over the top and then sprinkle with kosher salt. Serve and enjoy!